Originally published in National Mortgage Professional Magazine – February 2019 issue. By Brooke Mulder. 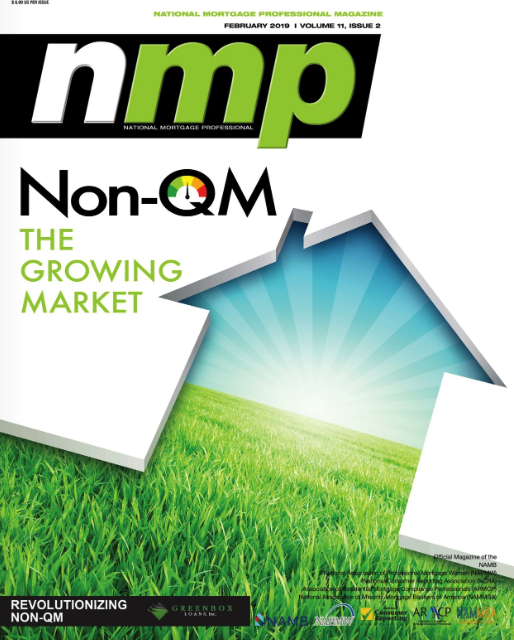 Non-QM is a hot button topic in the mortgage industry right now. Every other article and blog post seem to tout the rise of non-QM. It seems everyone is either offering non-QM products or thinking about offering them. And why not? Only offering conforming loan products leaves money on the table, in a time when margins are compressing, and additional revenue could make the difference between staying open and closing up shop for many lenders. Non-QM loans are just mortgage products that don’t comply with the Qualified Mortgage rule but aren’t necessarily higher risk. Some examples of what makes a non-QM loan are interest only payments, Jumbo, 40-year terms or having a borrower whom is not a typical full-time W-2 employee. While non-QM loan production has been increasing, there have been estimates that the untapped non-QM market is as high as $200 billion per year. Lenders that don’t offer non-QM products don’t just lose the potential revenue from non-QM borrowers. Realtor partners may stop sending all referrals over if their buyers frequently need a non-QM product. It’s easier to send buyers to a lender the Realtor knows will be more likely to get most clients approved. When a loan officer or lender has worked so hard to get Realtor referrals, they need to make sure they don’t lose those partnerships to the competition. That opportunity cost can’t be overlooked. No matter how great the relationship is between an LO and her Realtor partners, the Realtors will start sending referrals elsewhere if the LO is unable to help their clients. Lenders looking to get into the non-QM market should focus on carving out a niche and not try to do everything and offer all possible products. Lenders should pick a niche based on what they have been seeing come in. Hopefully most lenders will have CRM data to analyze on the loans they weren’t able to fund and why. If they dig into the data, it should tell a story about what type of non-QM products are currently the biggest opportunity. For lenders wanting to begin offering non-QM, or for those that already do and want to be as successful as possible, the biggest area of focus should be on automation. Automation options for agency products are plentiful these days. However, automation of many processes can still be achieved for non-QM. Lenders should use the technological advances in the mortgage industry of the last couple of years to their advantage; doing so will open up entire new populations of potential borrowers. Borrowers needing a non-QM mortgage deserve the same experience as borrowers in agency products. The mortgage borrowing experience has been greatly improved due to technology; the process is much smoother and more efficient with automation, alleviating many pain points for borrowers. Non-QM borrowers should also have access to the same quality level of service and experience. Many lenders say their mission is to provide access to homeownership to as many Americans as possible; expanding their product portfolio is vital to accomplishing this goal. But just expanding the portfolio is not enough if some borrowers are going to receive a sub-par experience. ►A digital lending platform that is both borrower-facing and lender-facing, providing an intuitive experience. The digital lending platform should be integrated with other key mortgage technologies as well: Credit providers to enable credit pulls at the point-of-sale, asset, income and employment verification providers to allow the borrower to provide necessary documentation as easily as possible, insurance providers to quickly pull HOI into a file, e-signature and document providers to quickly e-disclose and sign documents, and payment providers to easily accept appraisal payments. These integrations working together help alleviate risk for the lender by automating the information-gathering process, providing the most accurate data. With so many non-QM loans relying heavily on bank statements, easy access to those statements via asset providers will eliminate a huge pain point for both borrowers and loan officers. ►A non-QM Product and Pricing Engine integrated at the point of sale. This is integral and allows LOs to qualify and price loans through an automated process similar to what they are used to doing for agency loans. Additionally, it allows for transparency in pricing and closing costs for borrowers. If a lender leverages all of these tech pieces, it can be a game changer for it in the non-QM marketplace. Automation results in shorter processing times, higher borrower satisfaction, less risk and an all-around improved experience. Gone are the days of a loan officer calculating pricing by hand from a large sheet. Non-QM is no longer the scary, unwieldy beast for LOs it seemed just a few years ago. Some people worry that the rise of non-QM in today’s market is akin to some of the riskier products that led to the Great Recession. The Wall Street Journal recently stated about non-QM products that they are “a flavor of mortgage once panned for its role in the housing meltdown a decade ago.” However, the non-QM products of today are not the NINJA loans from the mid-aughts. Lenders can extend credit to deserving borrowers without putting themselves in a risky position, especially if they leverage automation. The loan process today is 180 degrees different than it was 13 years ago. Lenders that take advantage of the tools in the market are putting themselves in the best position to fund lower-risk loans, whether QM or non-QM. The biggest point of contention that many LOs feel when thinking about tackling non-QM mortgages is the perceived lack of guidance for a specific product. Anybody who has originated before will be forgiven for automatically thinking about the pages of guidelines that will need to be waded through in order to help the non-QM borrower on the phone. In order to make these loans less tricky for LOs, lenders must invest in automation to make the process as smooth as possible. It may not help the guideline deep-dive, but at least 12 months of bank statements can be connected automatically via API from the borrower’s financial institution. Looking into 2019 and beyond, non-QM is going to continue to grow. Lenders wanting to increase their market share of this segment need to focus on automation in order to increase efficiencies and reduce risk.